It was a slow food day. I had my yummy microwaved apple with Greek yogurt and cinnamon for breakfast. Had an orange and banana ( that was a little too old… 😦 ) for lunch. We went with leftover chili for dinner. Still delicious! Someone please tell me why I don’t make that more often? So as you see, nothing exciting for snapping photos. I’ve been holding off on this post for a slow day like today. For many years, I’ve been trying to stay away from diet soda. I really think that even though it’s “diet” it can have a negative effect on weight loss and weight maintenance. I remember first noticing this when I was leading my Weight Watchers meetings. Members would be following the program carefully, doing what they should and couldn’t understand why they weren’t getting the weight loss they expected. Almost every time, if I asked if they were drinking a lot of diet soda, they would say yes. I would ask them to cut back on it over the next week and when they would come in again, they’d have a loss, sometimes substantial. Since then I’ve been trying hard for myself to stay away from it. I do partake sometimes, but I have some good substitutes. 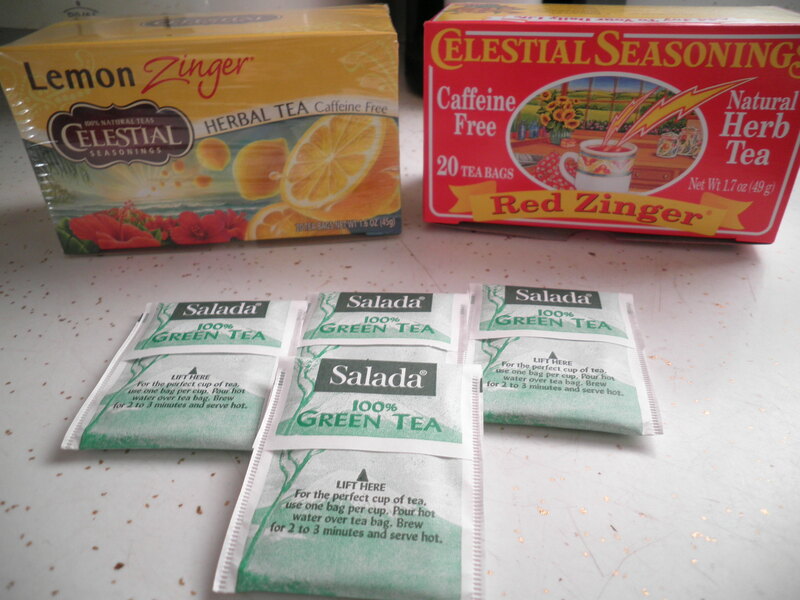 One of my staples is herbal tea. 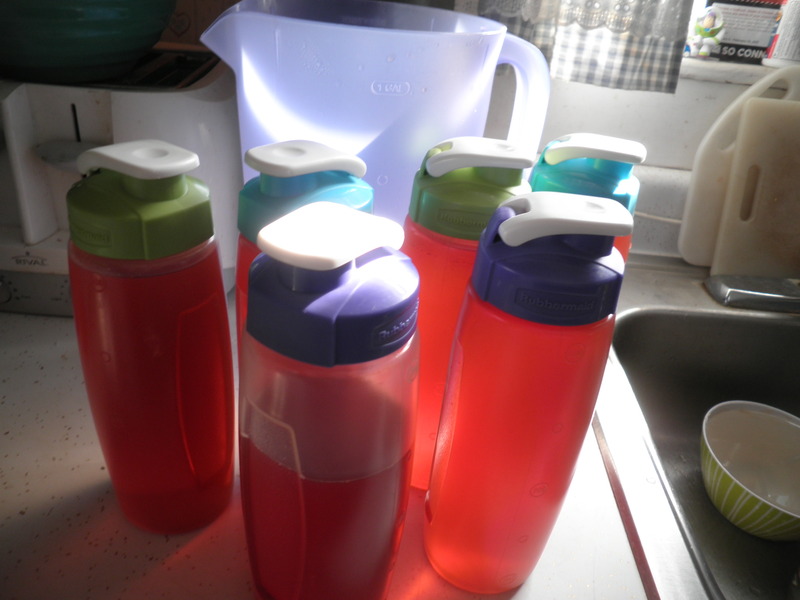 I make a big batch, put it in individual, reusable bottles and keep it in the fridge so that it’s there when I need it. 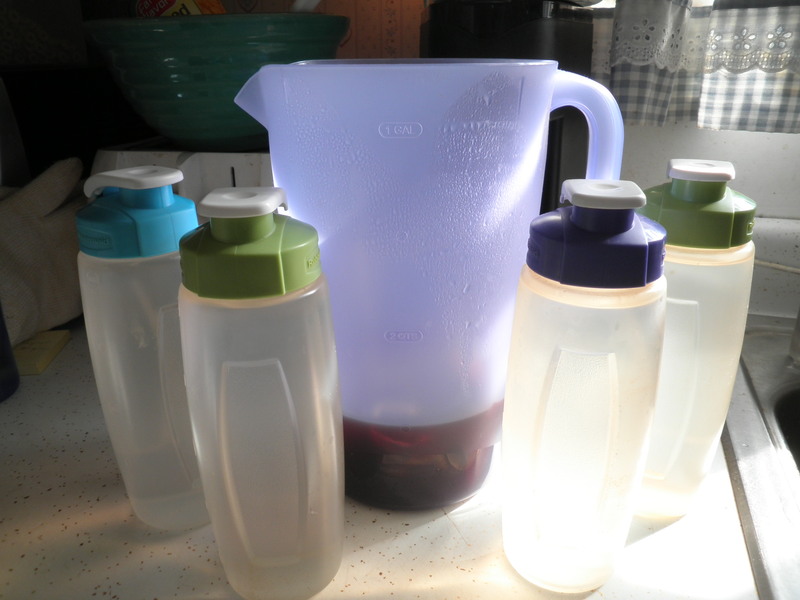 I heat up about 2 or 3 cups of water in my tea kettle and pour it into my really BIG purple pitcher! That’s a scary photo! But it’s hot water and tea bags…honest! It really is delicious. I add Splenda…still trying to get off of that, but it’s a process. My other favorite go to is so good that I can’t even tell you how much I enjoy it…and again, incredibly easy. Beach coffee!! Ok, please no comments about “couldn’t she find a box that didn’t look like it had been used in the Super Bowl?” It’s the only one left, I’m waiting for a shipment! 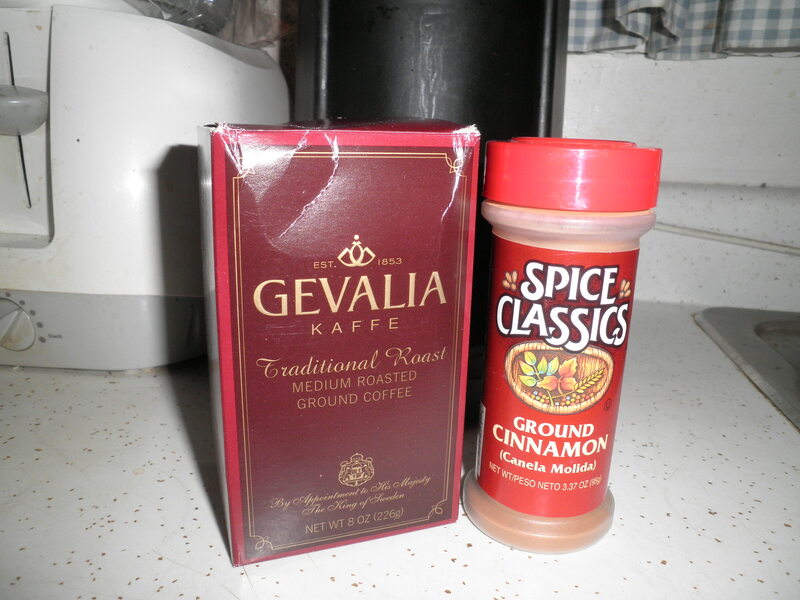 Any coffee will work with this, but my favorite is Gevalia traditional roast. Yes it costs a little more, but trust me, other coffees just never taste as good to me. Anyway, the immortal Beach Coffee is simple as can be, I think I’ve said that before today! 😉 You put your coffee into the coffee maker as you ordinarily would. You then add cinnamon…that’s it! You can add as much as you like. I don’t measure it, a few shakes usually work for me. Try it with a little to start with and add more if you’d like. There are other options for this as well. I love it with pumpkin pie spice also. I’ve used nutmeg…I’ve even used Chinese 5 spice powder! There’s one key thing to remember, however. When you add the cinnamon, be sure to stir it into the coffee grounds. If you don’t, you could experience a terrible mess. For some reason, if you just leave the cinnamon on top of the coffee grounds, it creates a barrier and the water does not go through and it will over flow. Gee, maybe cinnamon would be good for other things other than your heart! Either, way, it is just the best. I’m drinking it as I write this post and it makes my day. Not bad for a slow news day, huh? 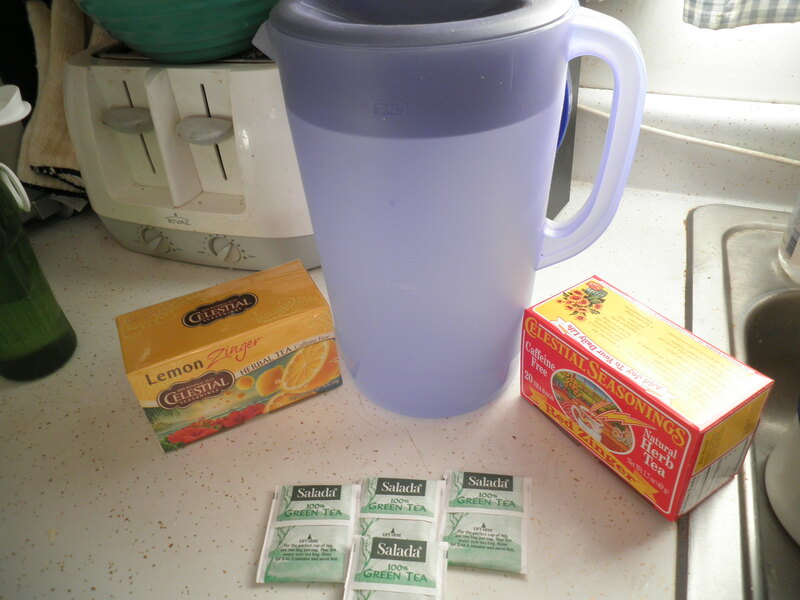 Drink your water (herbal tea counts! ), cut down on the diet soda and enjoy a cup of coffee. I’ve gotta go, I think I need another cup of Beach Coffee! Happy Weekend! beach coffee always gives me a lift! I love these alternatives to diet soda. And now with the studies linking diet soda to stroke why would anyone drink it? 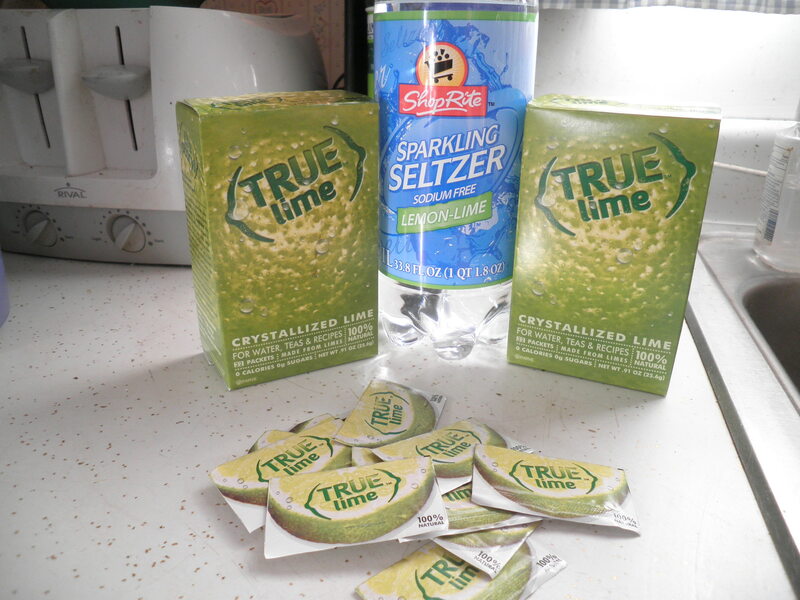 I had never thought of adding true lime to seltzer. I use true lemon though so I see how easy it would be. And the coffee – my friend from India uses cinnamon and cardamom and is it yummy! Oh, Ele and I love the beach coffee. We could make it when you come for Jim’s birthday. I just love the seltzer with the True Lime. It really is my favorite! 😮 That tea sounds incredible! 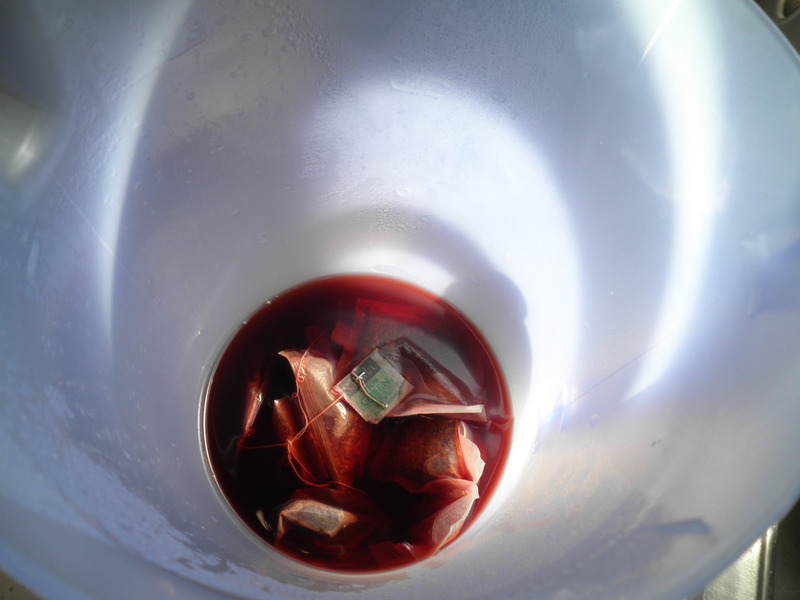 I’ve never really cared for the “zinger” teas, because they’re too fruity and not enough tea-y. Mixed together sounds awesome. Cinnamon and cardamom sounds great, too! I had Thai tea a few times, and something else like that… And the different spices made it taste so fancy.